Tuesday 30 July was the verdict day in the Bradley Manning court martial show trial that has been ongoing since 3 June at Fort Meade, Maryland, USA. Fifteen of us gathered in vigil at the Eros statue in Piccadilly and later processed single file to the U.S. embassy where we were joined by another 20+ folks as the verdict came down. 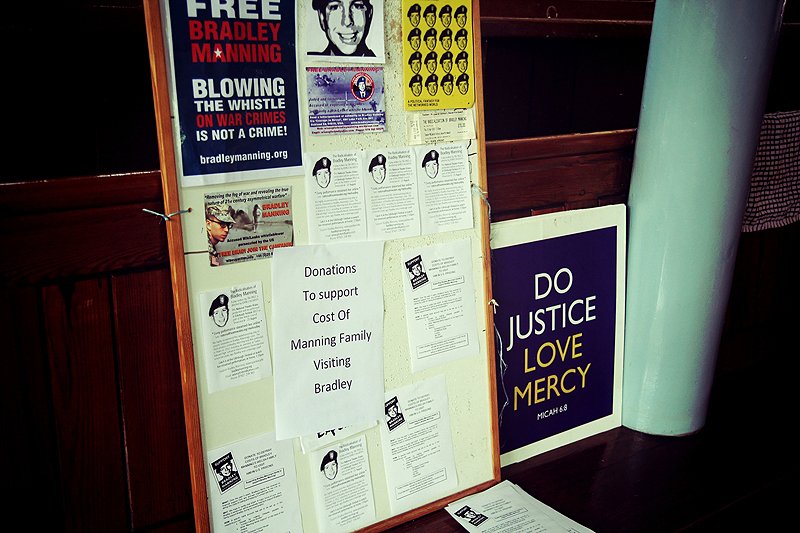 Last Sunday, we gathered at Giuseppe Conlon venue, as the sentencing phase for Bradley continues at NSA HQ, Ft. Meade, Maryland, USA. 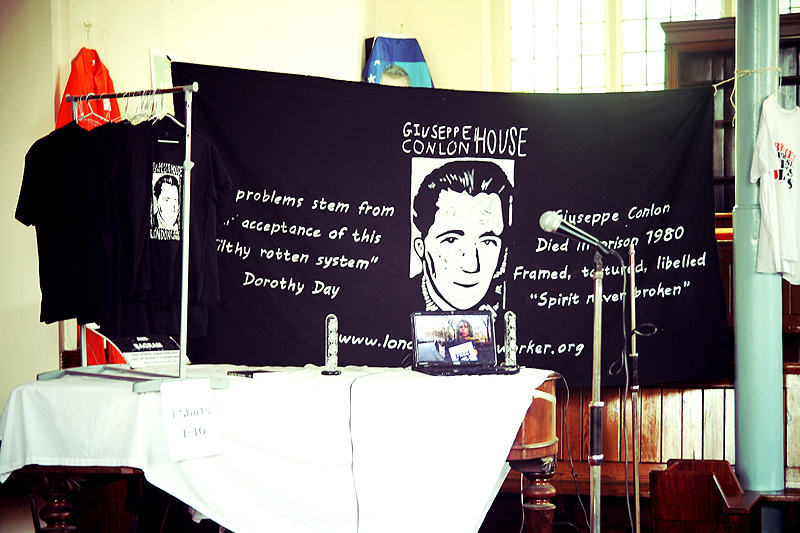 We named our venue after Giuseppe Conlon who left his native Belfast for London as “an act of mercy” to visit his son Gerry who had been fitted up, tortured and jailed. A similar fate was to meet Giuseppe and his in-laws the Maguires who offered him for a bed for the night. Giuseppe was to die in a British jail framed, libelled, tortured. Not even in death was he left alone as his body was flown back and forth over the Irish Sea and stashed at Hereford before eventually being laid to rest. The Maguires too, who were also innocent, suffered long years in British prisons. More on the Guildford Four and Maguire Seven here. Death penalty for the “acts of mercy”: from Wormwood Scrubs to the school run in Baghdad. On occasion, torture and death at the hands of empire remain a consequence for those practising the “acts of mercy”. Reflect on the slain father with his children coming on the scene of the Collateral Murder massacre. The Iraqi father refuses to do what we have done during these long wars. He refuses to avert his gaze. He parks his van and goes to tend to the wounded. He is slain, his children are critically wounded. But even in the Collateral Murder footage there is hope, evidence of the human in the form of Ethan McCord who refuses orders and rescues the children in an “act of mercy”. All Bradley had to do in Baghdad was what the rest of us were doing as the killing went on: to “avert his gaze”. Bradley Manning refused to do this and blew the whistle on these high crimes. For all the posturing, rhetoric and positioning of the short lived anti-war “movement”, most of the serious nonviolent resistance to these wars came from within the US & British militaries. The self appointed leadership of the anti-war movement dropped the ball and abandoned these military resisters. In Britain they have abandoned Bradley Manning over these last three years along with others in the military, people like Navy medic Michael Lyons who acted on the evidence provided by Bradley and was subsequently imprisoned for his conscientious objection to the wars. Giuseppe’s son Gerry survived 16 years in prison, like his father an innocent man. Gerry and his lawyer Gareth Peirce have been welcome visitors to our house of hospitality. 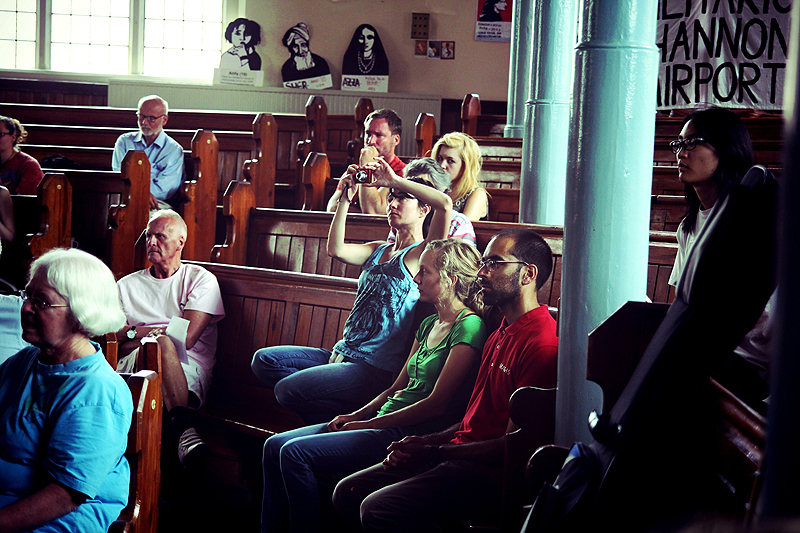 We know that Bradley Manning’s mother Susan waits, like Gerry’s mother waited, for him to return home. We believe that, like Gerry, Bradley will walk back into his Welsh home one day to be reunited with his family as a free man. 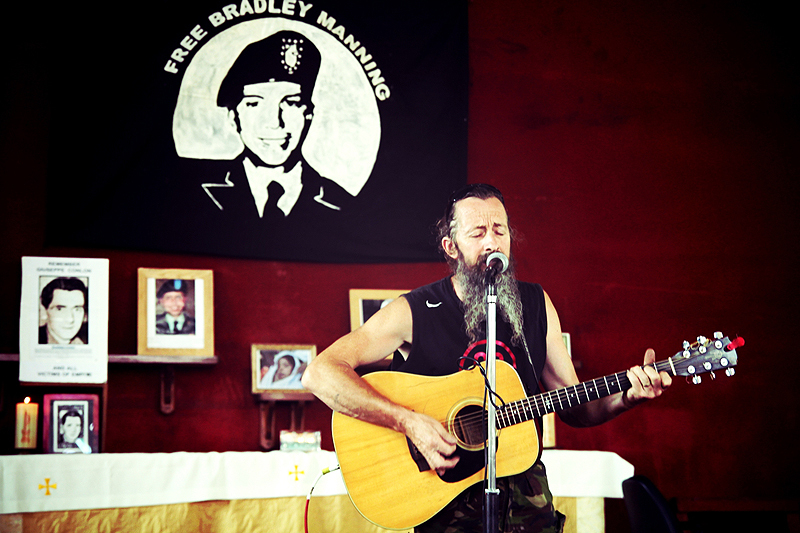 Throughout the past two and a half years, Catholic Worker, Veterans for Peace in the UK and other new and old friends have been out on the streets, outside courts and embassies in solidarity with Bradley Manning, Julian Assange and more recently Edward Snowden. We have undertaken this venture with minimal resources and unpaid personnel as the funded anti-war organisations and NGOs embraced cowardice and cultivated ignorance, averting their gaze from Manning and taking the US/Guardian-led default position on Julian. 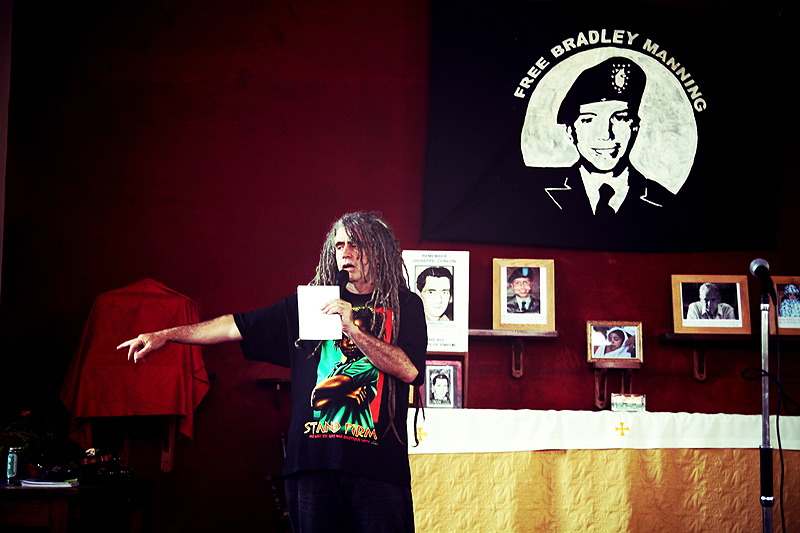 The August 4th event at Giuseppe Conlon Hall was in part a wake for Bradley’s youth on the streets, in part a celebration of the motley crew that has travelled with him through his torture, character assassination and imprisonment. All the solidarity we muster, often at short notice, is what it is. 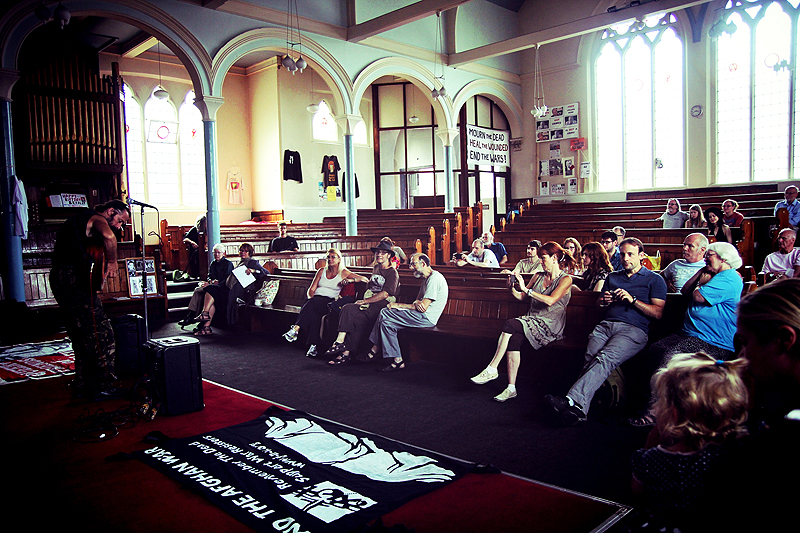 What it was on Sunday was folks from the Catholic Worker, Veterans for Peace in the UK, Queer+ Friends of Bradley Manning, artists who rarely go near activists, activists who rarely go near artists, Aaron Swartz’s Thoughtworks, geeks and technophobes, hippies and punks, young and old, tired and energetic, anti-war prisoners, a former policeman, combat veterans and, geographically, people from Aotearoa, Australia, Belarus, Czech, England, France, Ireland, Malaysia, Sardinia, Scotland, USA and Wales. So random. We are going to launch a funding appeal to help Bradley’s family to support him at this transatlantic distance, for example by contributing towards travel costs so that family members can visit him. Since Sunday, Razz is planning to host a fundraiser at Tottenham Chances; Jello Biafra has been in touch and will do what he can as he passes through London en route to Paris from Blackpool – gigging at Camden this Monday; Maria’s put the video up; Nastya has sent us some photos. So it’s all good. 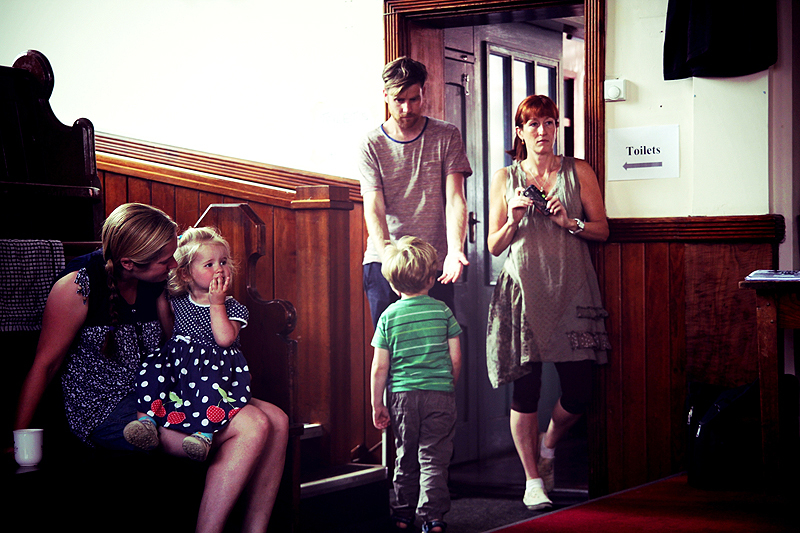 Some of those who spoke and performed were…. Les from the National Interest Band [Video] (above) and John McClean (below). 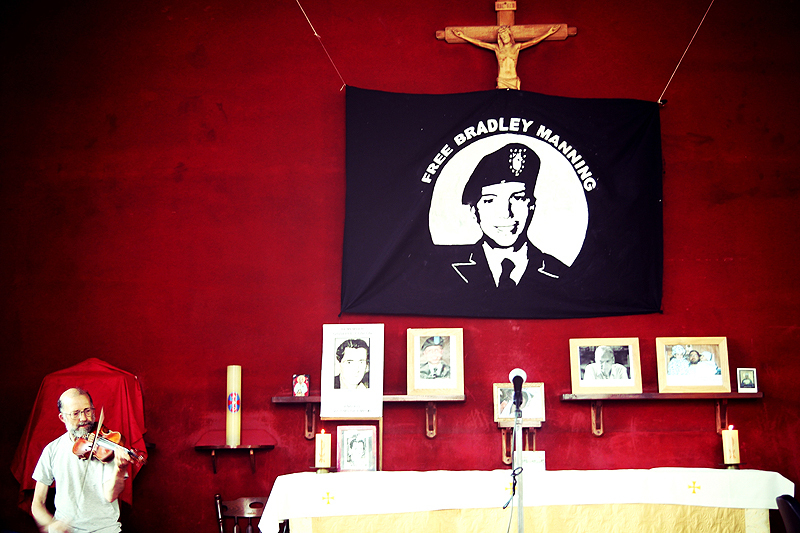 The sentencing part of Bradley’s trial continues and updates are available from bradleymanning.org in the US. Updates and reports from solidarity actions in Wales, Ireland, Scotland and England can be found here at wiseupaction.info. At the conclusion of Bradley Manning’s military show trial he will face a maximum sentence of 90 years following his torture and three years of pre-trial detention. Gallery | This entry was posted in Lyons, Manning, Reports, Snowden and tagged anti-militarism, anti-war, Bradley Manning, Britain, Catholic Worker, Court Martial, Edward Snowden, London, Michael Lyons, performance, Queer Friends of Bradley Manning, solidarity, speakers, torture, trial, Veterans for Peace, WISE Up. Bookmark the permalink. The crimes associated with waging aggressive war, laid down in the Nuremberg Principles and the Rome Statute of the International Criminal Court, http://en.wikipedia.org/wiki/Rome_Statute_of_the_International_Criminal_Court are clear. “If any person, in furtherance of a state policy, orders the use of force to attack members of a national, ethnic, racial or religious group, that person and everyone who takes part in the attack is responsible for the consequences, breaks international law and, if it results in the deaths of innocent people, commits the universal crimes of genocide, crimes against humanity, war crimes, aggression or conduct ancillary to such crimes”. Nuremberg Principle IV states, “The fact that a person acted pursuant to order of his Government or of a superior does not relieve him from responsibility under international law, provided a moral choice was in fact possible to him.